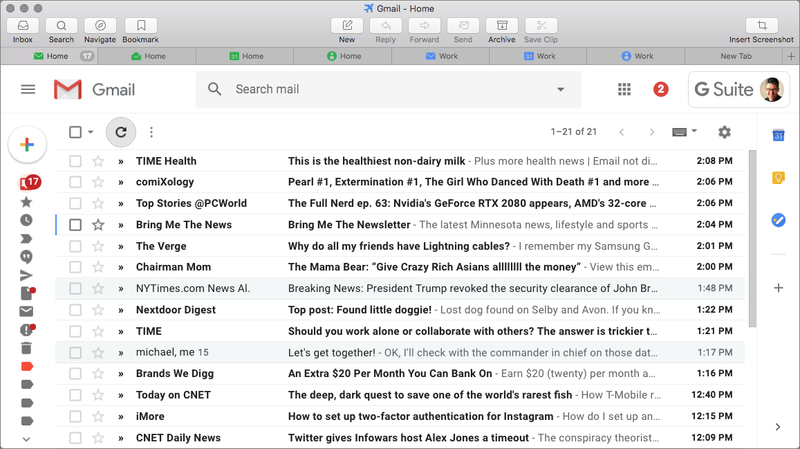 The Mailplane email app has long catered to Mac users who like Gmail’s Web-based interface but don’t want to forgo desktop capabilities that native mail clients provide. Mailplane is a “site-specific browser” for Gmail (See “Make Site-Specific Browsers with Google Chrome,” 6 March 2015), but it offers greater Gmail-specific functionality than a standard Web browser like Safari or Chrome. The just-released Mailplane 4 preserves these broad outlines while unveiling some significant improvements. 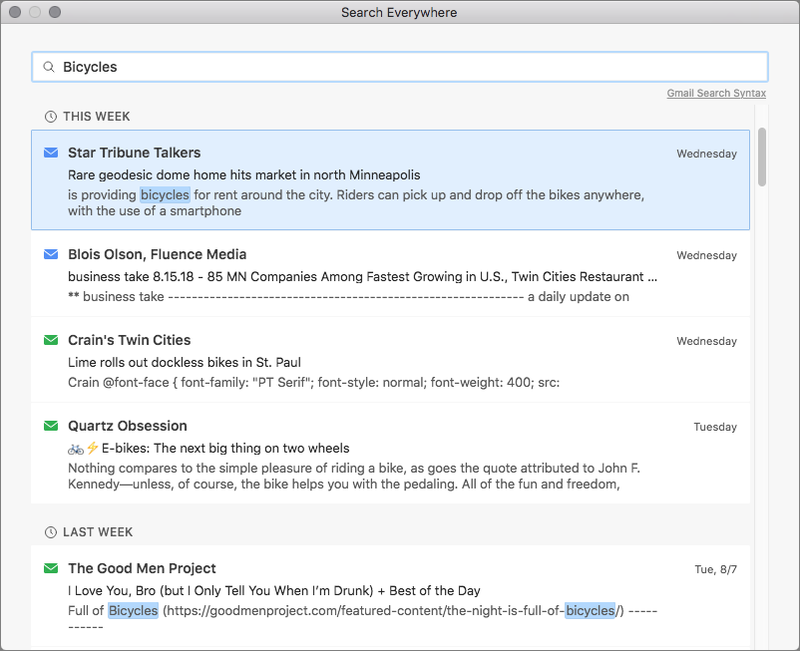 Mailplane 4 sports a range of usability upgrades that hook it ever more deeply into macOS, buttressing its status as an alternative to native apps such as Apple’s Mail. Simultaneously, Mailplane 4 has augmented Web capabilities that provide, among other things, better support for Google’s alternative Inbox webmail service along with the more mainstream Gmail. But perhaps the most significant change is under the hood, and it’s one that will likely excite those who like to extend Gmail’s capabilities. Long built upon Safari’s WebKit rendering engine, Mailplane now harnesses Google’s Blink engine. This change means that power users can use supported Gmail-specific Chrome extensions to turbocharge Mailplane’s capabilities. 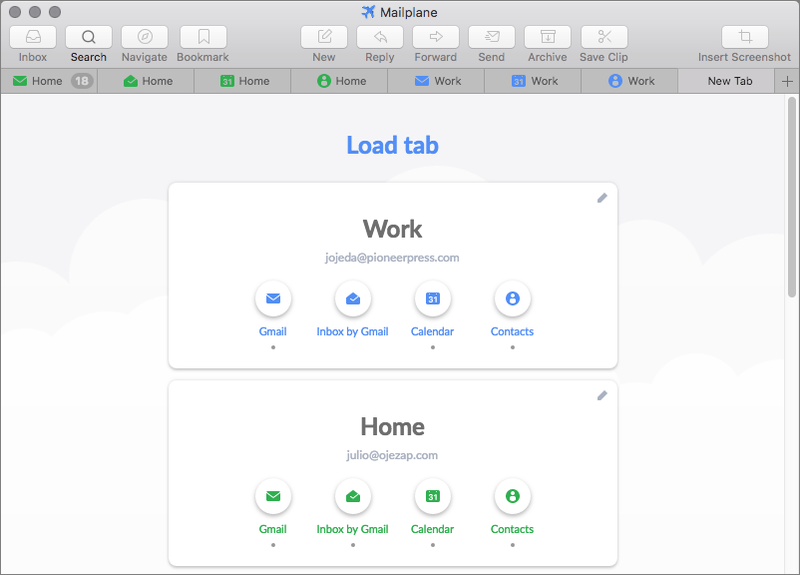 As a site-specific browser, Mailplane lets Gmail users manage email in a simpler window that isn’t cluttered up with a standard Web browser’s interface elements or bogged down by dozens of unrelated Web-page tabs. Mailplane has its own toolbar, but you can hide it. Mailplane goes a bit beyond Gmail too, providing access to Google’s Inbox alternative email interface, Google Calendar, and Google Contacts, each in its own tab. More importantly, Mailplane is in many ways a native Mac app. As Adam Engst wrote years ago, the developers have “done a truly amazing job of turning what is essentially a Web browser into a real Macintosh application” (see Zen and the Art of Gmail, Part 4: Mailplane,” 16 March 2011). 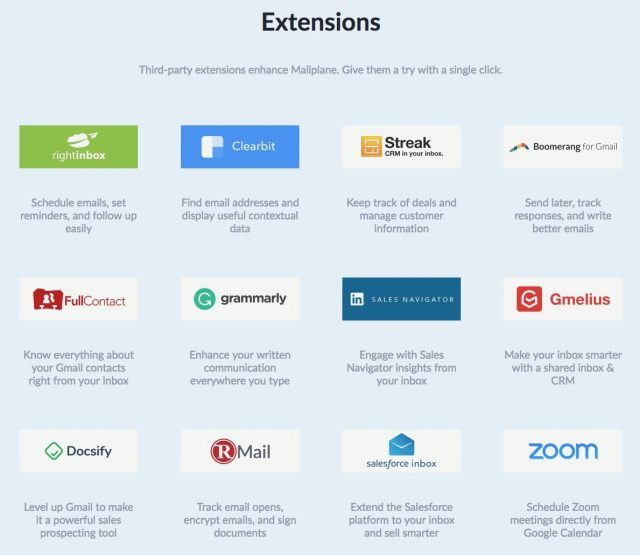 Mailplane’s longtime Mac-specific features have included Keychain support, working as your default email app, a Share menu extension, notification sounds, Quick Look previews of attachments, and more. I have been testing Mailplane 4 for about a month, and I’ve found it to be a solid upgrade. There’s a lot to cover in terms of usability improvements, so I’ll whip through the highlights. Mailplane 4’s tab functionality is more flexible and user-friendly than in the past. Clicking the + button to create a new tab now opens a Load Tab page. For each configured account, the page shows buttons for Gmail, Inbox, Calendar, and Contacts. Accounts on the page are coded with user-customizable colors. You can also open multiple instances of an account’s Gmail, Inbox, Calendar, and Contacts in separate tabs, which was not possible before. Unsurprisingly Gmail’s native search capabilities are excellent, and Mailplane 4 builds on them. Notably, you can search in multiple Gmail and Inbox accounts simultaneously. Open the app’s standalone search window, type query terms, and press Return. Each search result displays an envelope icon (closed for Gmail, open for Inbox) with a color corresponding to the message’s account. Query terms are highlighted for easier reading. 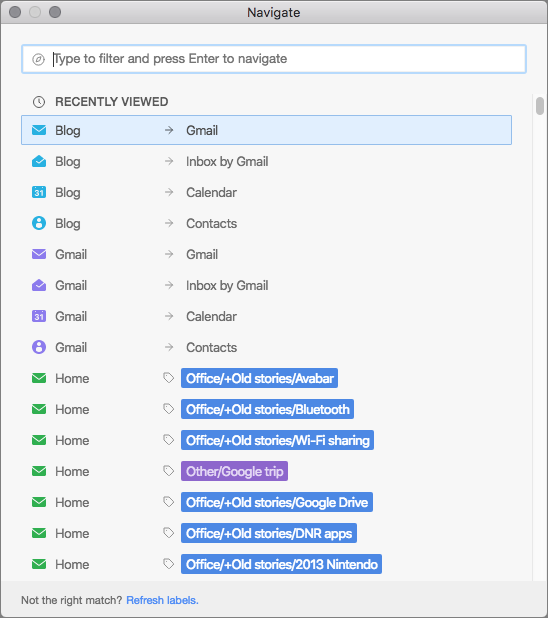 Mailplane 4 offers a standalone Navigate window that lets you search for Gmail’s labels, which are tags that can be assigned to messages and used instead of folders, across all of your accounts. Start typing in the search field and Mailplane displays labels with that text string in their names. When you find the label you want, clicking it pulls up all email messages with that label. This feature, though not essential, is nice for those of us with lots of labels in a nested structure that can be unwieldy to navigate the traditional way. Before you filter the list, the Navigate window shows recently used labels, which may let you avoid searching. In my case, however, it didn’t accurately show which labels I had used recently. Mailplane has long had Mac-native notifications, but Mailplane 4 adds actions to its notifications. For example, you can click a Reply button within the notification window to open a quick-reply field for responding right there. Similarly, you can archive a message by clicking an Archive button in the notification. You can have only one button—Reply or Archive—for all incoming messages in a particular account, but not all of your accounts have to be on the same setting. Hidden from view, there’s a nerdy way to augment this feature. At the end of a quick reply, type “/a” to reply-all, “/e” to archive the message, or “/d” to save the reply as a draft. 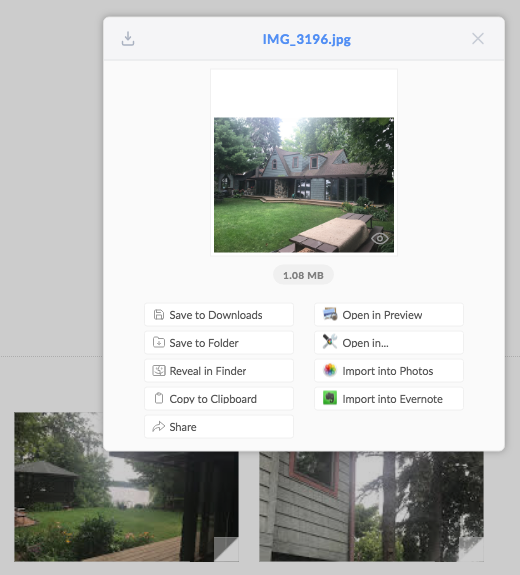 Image attachments in outgoing messages now incorporate annotation controls—including arrows, text, and shapes—that stock Gmail and Inbox don’t provide. There’s also a handy text-blurring option for masking sensitive information. To use these features, click an image attachment in an email draft, and then click the Annotate button that appears. Instead of downloading an attachment to the desktop or another Mac folder, you can instead open it in a pre-designated default app. 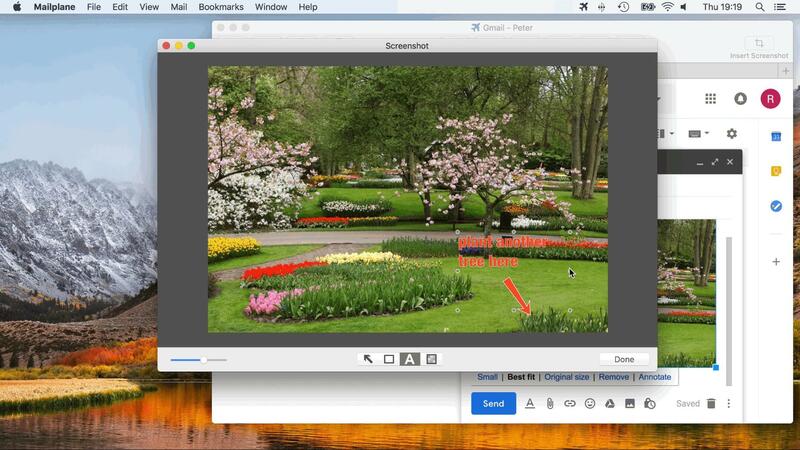 You can set Word documents to open in Pages, for instance, and have images open in Photos). You do this by clicking the middle of three buttons that appear when hovering your cursor over an attachment. Even better, the right-hand … button opens a Show All Options window with an assortment of useful actions. 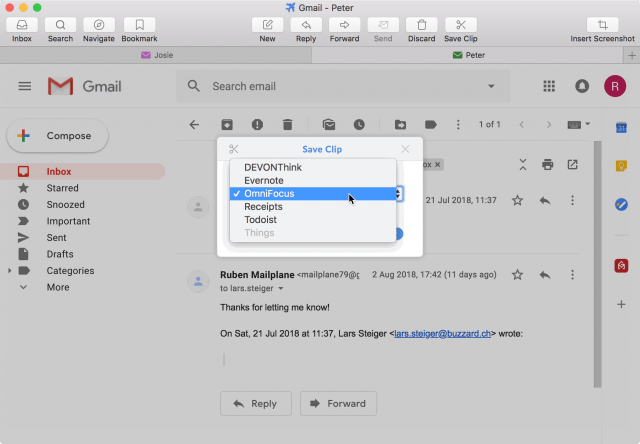 Similarly, you can export entire email conversations—including attachments and inline images—as PDF files directly into note-taking or task-management apps such as DEVONthink Pro and Evernote. You can also create tasks based on email conversations in OmniFocus, Todoist, and Things. Mailplane 3 previously offered Evernote clipping, and even a toolbar button for that purpose, but there’s no such button—or similar ones for other relevant apps—in Mailplane 4, which is odd. However, the app does provide an Import into Evernote button among its attachment actions (see above). This simple feature lets you bookmark any email message for future reference, and you can tweak the bookmark text. This feature is not new, but Mailplane 4 makes it more visible via a drop-down menu. Previously, it was buried so deeply as to be all but useless. Mailplane’s bookmarks are an alternative to starring messages and one that is not account-specific since all bookmarks are consolidated in Mailplane’s Bookmarks menu. The interface can become unwieldy if you make a lot of bookmarks, though. Mailplane has long incorporated access to Inbox along with Gmail, but until recently the two services weren’t equally supported. 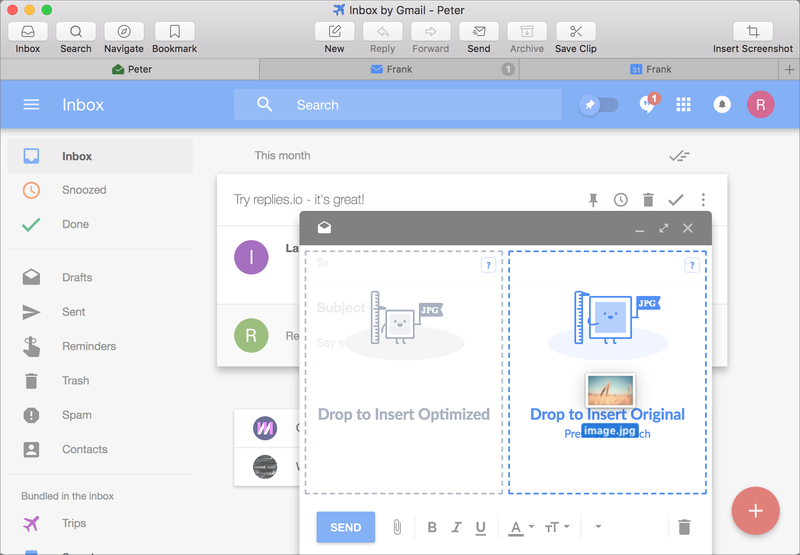 For instance, both Gmail and Inbox in a regular browser let users determine whether to attach an image in an original or size-optimized form, but until recently Mailplane provided this feature only in Gmail. Now, parity has been achieved. Auto-BCC is another feature now supported across the board. Offline: Mailplane has a new offline mode that allows for limited functionality—such as replying to a message—without an Internet connection. The app is still largely crippled when offline, though. Per-account Zooming: You might like Gmail, Inbox, Calendar and Contacts set at different zoom settings, which is now possible. Previously, they shared the same zoom setting. Security Keys: For those who use two-factor authentication, Mailplane now supports physical security keys that plug into the Mac’s USB port for a secure login. Keyboard Shortcuts: Mailplane 4 provides keyboard combos for moving from tab to tab without resorting to a mouse or trackpad. Custom Gmail CSS: A Mailplane 3 feature initially dropped from Mailplane 4 but later restored, custom CSS allows Web-savvy Mailplane users to customize Gmail’s interface. Mailplane has been, since its inception, built atop the WebKit rendering engine used by Safari. The developers have now abandoned this approach, rebuilding Mailplane atop Google’s Blink rendering engine, essentially making it a specialized version of the Google Chrome browser. This, the developers tell me, fixes a number of problems. First, it makes sense to deploy Google-based services in a variation of Google’s own browser for maximum compatibility. More importantly, a Chrome foundation makes it easier for the developers to support extensions that have long augmented browser capabilities. When it was based on WebKit, Mailplane offered a modest library of five extensions—including Boomerang to control when messages are sent and Clearbit Connect for seeing user profiles in the right-hand sidebar—but baking these capabilities into the app was a lot of work. Migrating to Chrome reduces this coding overhead to nearly nothing. Unfortunately, you cannot install any Chrome extension you wish, as you can when running Gmail in the stock Google Chrome browser. Mailplane still offers a carefully curated extension library. Still, there are now more options—a dozen in all. The list includes Boomerang, along with Grammarly for improving grammar and FullContact, an alternative to Clearbit Connect. Even more extensions are on the way, the developers tell me. That’s good news because there a wide assortment of other Gmail-related Chrome extensions are nowhere to be found in Mailplane. I’ve used Mailplane as my default Mac email client almost since its launch more than a decade ago. I do this because I prefer Gmail’s Web-based interface to that of a desktop email client such as Apple’s Mail. Google’s Inbox is growing on me, too. While I’d be fine using either Gmail or Inbox in Chrome, I appreciate the added Mailplane features that give it a Mac flair. It’s a win-win that has kept me loyal to the app even as I have tinkered with other Mac-based email clients over the years. Mailplane’s enhancements to Gmail’s stock Web-based features are great, too. Mailplane isn’t for everyone or even every Gmail user. Some people don’t like the standard Gmail or Inbox Web interfaces, or just prefer working in a native email client once they have plugged in the right Gmail settings. But if you’re a Mac user, and you’ve used Gmail or Inbox in a Web browser, I encourage you to give Mailplane a try— there’s a two-week free trial. The app can also be a nice fit in companies, nonprofits, government agencies, and educational institutions that have deployed Google services—including Gmail and Google Calendar—but limited them to Web-based access rather than allowing their use in Apple Mail and other desktop applications. That’s true at my day job, for instance, but Mailplane works just fine. My use of Mailplane 4 has been marred by a few minor quirks. It sometimes forgets its user-set window proportions, for one thing. And certain Google features, such as setting the density of message lists, have worked inconsistently for me in Mailplane while functioning reliably in Chrome and other stock browsers. 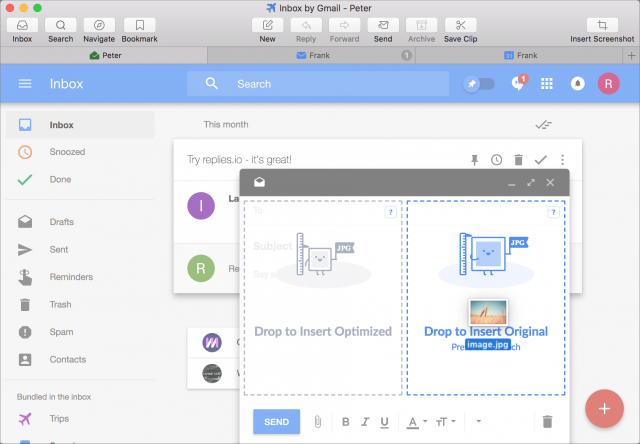 But, overall, Mailplane 4 is a solid upgrade of an app that’s important to a set of Mac users. As always, Mailplane straddles the Web and desktop worlds, filling a need that neither stock browsers nor native mail clients can fully satisfy.